Hey, Temple won a bowl game! 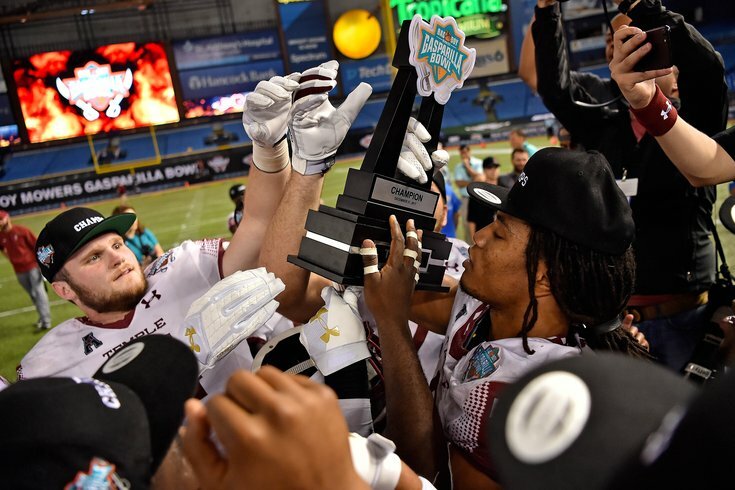 Temple Owls teammates celebrate with the trophy after defeating the FIU Panthers in the 2017 Gasparilla Bowl at Tropicana Field. I have not been a good alumnus this year. I've only watched maybe two quarters of Temple football this season, and while watching simultaneously with last night's clunker of a Sixers game, I realized the quarterback I remembered starting the season was no longer playing. And the beginning of the BIG BOY GATOR BOWL EXTRAVAGANZA Bad Boy Mowers Gasparilla Bowl didn't necessarily inspire a whole lot of confidence in the Owls. Early in the first quarter, quarterback Frank Nutile threw a lateral to wideout Isaiah Wright. It was too high, and instead of trickling out of bounds, the ball bounced off Wright's hands and into the those of an opposing player from Florida International University. The first half of the game was flat out sluggish to watch, and ended with a 7-0 Owls advantage after a rushing touchdown by Nutile, a redshirt junior from Wayne, New Jersey, who is studying accounting and whose hobbies are literally just other sports. But near the end of the third quarter, the Owls came screeching down from the sky, picking up FIU players and dropping them into the stands got on a roll. What looked like a fumble at the goal line turned out to be a touchdown for running back David Hood, a redshirt junior from Atlantic City majoring in media studies and production whose nickname is inexplicably "Tre." Then in the fourth quarter, Wright, presumably still ticked the heck off about the lateral he couldn't corral earlier in the game, caught a pass over the middle and took that football all the way into the end zone. After scoring, Wright high-fived a man in a Temple polo shirt. "Hey man, nice shirt you're wearing," Wright may have said. "Did you see me score just there?" "Yeah, that was great. I'm glad we're best friends," polo man may have replied. 'I have scored! high-five me, polo man.' - Temple wide receiver Isaiah Wright, maybe. 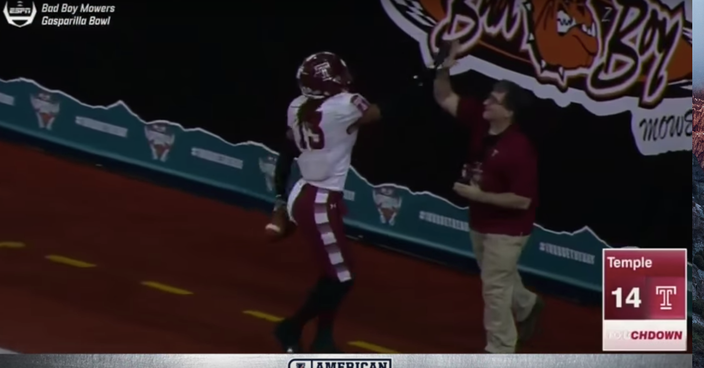 The Owls capped it all off with another rushing touchdown from Ryquell Armstead, a junior studying criminal justice whose favorite movie and television show are also about sports. Mike: "Go Owls! They're doing the fight song! #fightFightFight"
Me: "I'm not watching, watching 'The Office' now instead!" Me: "2. I feel like I haven't appreciated the early seasons in a while." Mike: "I just rewatched. So, so good." You can find an actual recap here and watch highlights of the game below.